The weather in Puerto Pollensa is fantastic weather all year round, having in mind that in Mallorca we have an average of 60 days of rain and 300 days of sun. Winter weather in Puerto Pollensa is always mild, and the temperature rarely falls below 9 degrees. 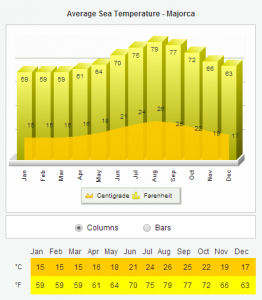 The weather changes in Summer season, from May till September, the average high temperature in Puerto Pollensa stands around 26 °C. August, with more than 30 °C of average high, is no doubt the hottest month of the year, and a perfect time to go to enjoy one of the numerous beaches in Puerto Pollensa. Summer in Puerto Pollensa starts in June and it ends in September. 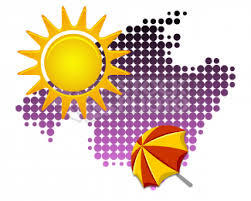 Summer season offers plenty of sun with temperatures between 27 degrees and 30 degrees or even more in July and August. The hot Summer season bring tourists by storms to Puerto Pollensa to sun bathe, swim, and be a part of the bustling nightlife. In June the average highest temperature stands at 27°C at the beginning of the season and as the period progresses it climbs in the following months and rises to 30°C to 40º C in Ausgust. However in September the temperature returns to 27°C again. As coastal area receives a cooling breeze and humidity remains low the heat appears uncomfortable to the tourist. Autumn is warm and sunny in Puerto Pollensa. During autumn, October and November, tourists like to visit and arrange party on the beach, for the average high temperature stands at 23°C, which is bearable. Nighttime temperature brings cold for the island with the average minimums 12°C. 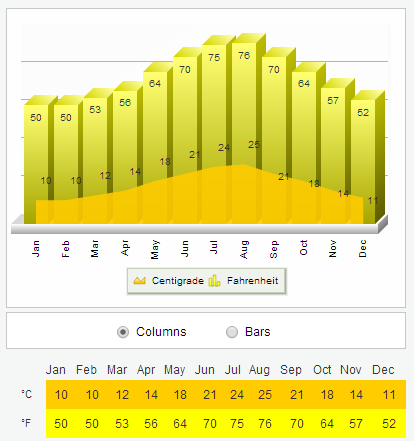 However, in November the average high temperature falls dramatically and stands at 18°C. Nighttimes appear chilly with the regular of 8°C. 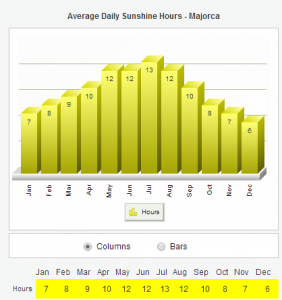 Winter, which is remarkably mild in Puerto Pollensa, comes in December and lasts till February. The regular maximum temperature falls quickly and stands at 14°C in January. 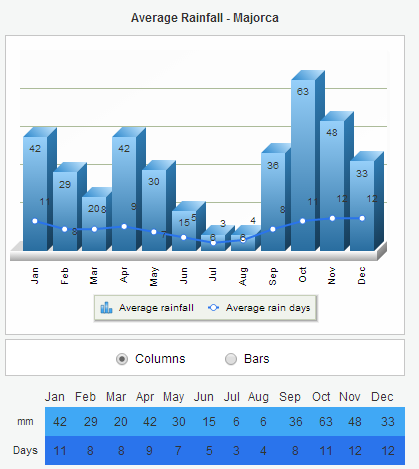 However, in the following month it rises to 15°C. Nighttimes experience average minimums around 4°C and it can get down to freezing. Although up the mountain snowfall is common it hardly settles in the lowlands. Heavy downpour often occurs but it reduces as the season progresses. Winter in Puerto Pollensa best suits travelers looking to relax and/or explore a great island but note that many restaurants and bars will be closed. Spring, from March till May, remains warm with low rainfall in Puerto Pollensa. 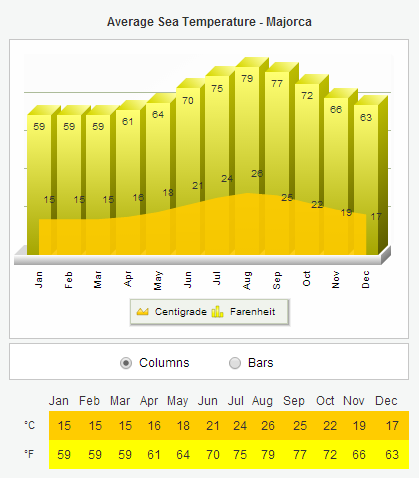 The regular maximums climb to 16°C in March, 18°C in the following month and 22°C in May. The temperature may fall in mid April and the maximums may stand at 20°C. Nights may still get cold during spring in Mallorca and spring season is generally too cold for swimming in the ocean.